This is the IRS and you have a lawsuit against you. You must send us money or you’ll be arrested, well…..send us gift cards Have you heard about this scam? We have and so have many others. Don’t fall for it. The IRS will not robo call you, send you a fax, or email you saying to call them for further information on how to pay for your “tax deficiency and tax fraud” especially with gift cards. Remember, do not give out your bank account information! It’s tax season and rolling up on April 15th really quickly is perfect timing for these scammers to kick it into high gear. These scams cost victims money they cannot afford to lose. For more information, visit the IRS website about scams here. 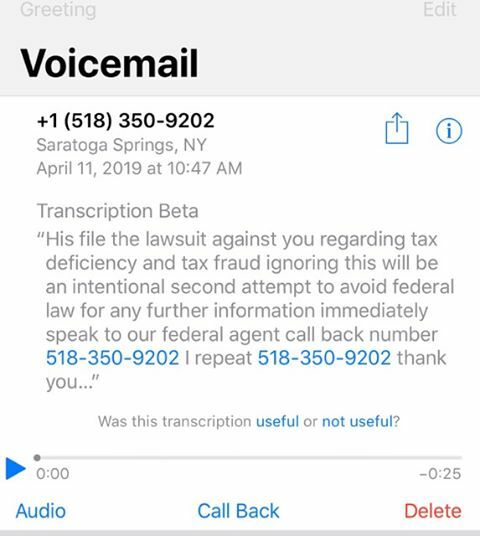 Below is a screenshot of this scam sent to us by a concerned citizen that was aware that it was NOT the IRS.